Comments: Marvel UK`s original superhero flagship, Mighty World of Marvel, debuted the week ending 7th October 1972 (it was cover dated 7th October, but most comics were dated for the last day before the next issue came out to prolong shelf life, and so MWoM #1 probably came out on the 1st October). It marked Marvel's first stab at reprinting its own comics for the UK market, rather than licensing others (such as Alan Class and Odhams) to do so. A weekly black and white (although initially with some colour pages) magazine-size publication it featured reprints of stories from Marvel comic`s most popular heroes and teams. The initial line-up included Fantastic Four, Hulk and Spider-Man, but the last of these was soon given his own title, and replaced in Mighty World of Marvel by Daredevil. Other strips came and went, sometimes in connection to the cancellation of failing titles which were merged into their more successful siblings, a common practice for UK comics. Mighty World of Marvel incorporated The Avengers as of MWoM #119, picking up the Avengers and Conan from that merger; Planet of the Apes with #231; Fury with #258; and Complete Fantastic Four with #298. Each merger resulted in Mighty World of Marvel gaining new sub-titles for a time, but the biggest change finally came in 1979, when new Marvel UK editor in chief Dez Skinn decided to rebrand Marvel UK's titles as part of an attempt to turn around flagging sales. Thus the last issue of Mighty World of Marvel was #329, cover-dated 10th January 1979; with #330 it became Marvel Comic. 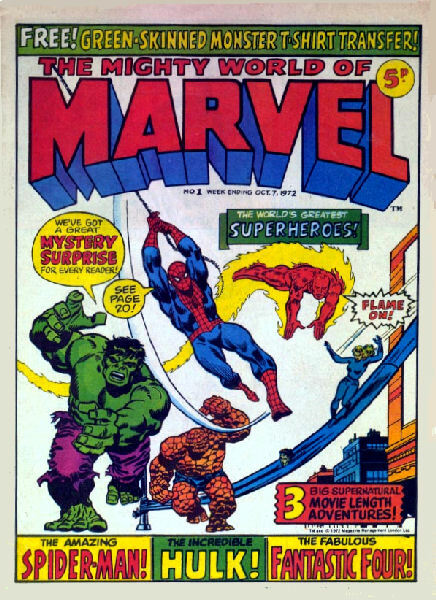 It continued under this new title until Marvel Comic #352, cover dated July 25th 1979, was the final weekly issue. While Marvel Comic officially merged into Spider-Man Comic, and one strip, Daredevil, transferred to that new home, two other strips (Avengers and Ms. Marvel) instead moved to the new monthly title, Marvel Superheroes, which continued Marvel Comics numbering, thus launching with issue #353.